870 Naval Air Squadron (870 NAS), also known as VF-870, was a squadron of the Royal Canadian Navy (RCN). It was formed when 803 Naval Air Squadron of the Royal Navy was renumbered to 870 NAS on 1 May 1951. It operated throughout the 1950s and early 1960s before disbanding on 7 September 1962. It was the first RCN squadron to operate jet aircraft. 870 Naval Air Squadron was formed on 1 May 1951 when 803 Naval Air Squadron of the Royal Navy's Fleet Air Arm was re-numbered. It was initially based at RCNAS Shearwater, Nova Scotia, with the Squadron operating the Hawker Sea Fury FB.11. In November 1952, 870 NAS adopted an American-styled squadron designation becoming VF-870. On 24 September 1953, the Squadron relocated to RCAF Summerside on Prince Edward Island. VF-870 had its first deployment in January 1954 when it was attached to HMCS Magnificent (CVL 21), it finished its deployment on 9 March. The Squadron stood down for the first time on 30 March. Four McDonnell F2H-3 Banshees (of VF-870 or VF-871) in flight over HMCS Bonaventure (CVL 22), in the late 1950s. VF-870 reformed on 1 November 1955, this time equipped with 10 McDonnell F2H-3 Banshees, becoming the first jet squadron in the Royal Canadian Navy. The commanding officer of VF-870 at its reformation was future Canadian Chief of Defence Staff, Lt. Cdr. Robert Hilborn Falls. A total of 39 Banshees were eventually purchased second-hand from the United States Navy (USN) for a cost of $25 million, serving with VF-870, VF-871 and VX-10. VF-870 was attached, along with VF-871, to the aircraft carrier HMCS Bonaventure (CVL 22) – Canada's newest carrier – from which it would deploy. While not deployed, VF-870 was based at RCNAS Shearwater. The Squadron participated in the 1956 Canadian International Air Show in Toronto. The Squadron suffered a loss in August 1957, when a Banshee crashed into a Grumman Avenger AS.3, with one aircraft taking off as the other was landing. VF-870 made their first deployment on 7 September 1957, which lasted until 30 October. On 26 March 1959, VF-871 amalgamated with VF-870 thus leaving the Squadron as the only RCN unit to operate the Banshee. 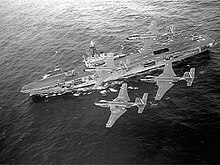 The Squadron made its final deployment on HMCS Bonaventure on 9 April 1962, lasting until 29 June 1962. While not deployed, VF-870 flew intercepts in the Canadian sector of NORAD. VF-870 disbanded for the last time on 7 September 1962. Throughout its service, the Royal Canadian Navy lost 12 of the 39 Banshees it had purchased, including those of VF-870. A replacement for the Banshee never came to fruition making VF-870 one of only three RCN squadrons to ever operate a jet fighter. ^ a b "Volume 4: Operational Flying Squadrons". National Defence and the Canadian Armed Forces. Retrieved 8 December 2018. ^ Walker, R. W. R. "Canadian Military Aircraft – Serial Numbers – Royal Canadian Navy – 1945 to 1968". Canadian Military Aircraft Serial Numbers. Retrieved 8 December 2018. ^ a b c d e Forsyth, Bruce. "The rise and fall of the Royal Canadian Navy's Fleet Air Arm". Canadian Military History. Retrieved 8 December 2018. ^ a b c d e f g h i j k l m n "870 Naval Air Squadron". www.wings-aviation.ch. Retrieved 8 December 2018. ^ "870 Squadron (Canada)". Fleet Air Arm Archive (Archived). Retrieved 8 December 2018. ^ a b c Bourdon, Buzz (9 December 2009). "Admiral Falls 'trained for war, acted for peace'". The Global and Mail. Retrieved 8 December 2018. ^ a b "McDonnell Banshee". Shearwater Aviation Museum. Retrieved 8 December 2018. ^ a b "McDonnell Banshee". Royal Canadian Air Force. Retrieved 8 December 2018. ^ Kealy, J. D. F.; Russell, E. C. (1967). A History of Canadian Naval Aviation 1918-1962. Ottawa: Queen's Printer. pp. 47–71. OCLC 460555. ^ Cook, D. Glenn. "Aircraft on display: McDonnell F2H-3 Banshee 126464 (Archived)" (PDF). Canada Aviation and Space Museum. Retrieved 8 December 2018. This page was last edited on 19 March 2019, at 17:31 (UTC).